Football - Sowerby Bridge v Ryburn. Lee Ward for Sowerby Bridge and Mark Thompson for Ryburn. 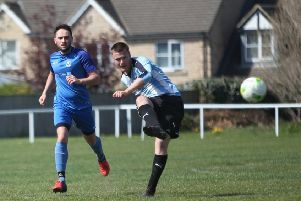 HAT-TRICKS from Dan Boyd and Liam Senior helped Sowerby United to the biggest win of the day in Halifax AFL’s Premier Division. They won 7-1 away to Copley United at Shroggs Park and their second successive win on the road lifted them to fourth place. They were ahead after two minutes when good work from Harvey Walsh set up Boyd to score a fine goal. Copley then had a good spell but never threatened to penetrate the Sowerby defence. The lead was doubled when super build up play ended with Liam Senior finding the net. However, Senior struck, Boyd got his third and Senior followed suit from the penalty spot. The outstanding Corey Henderson completed the scoring from the edge of the box. Denholme United’s prospects looked bleak when they trailed visitors Calder ‘76 3-0 entering the last quarter. However, they scored four times in less than 15 minutes to take the spoils by 4-3 and leave the Foster Park visitors deflated. Max Crossley opened the scoring midway through the first half from keeper Matthew Senior’s long kick down the slope on a small pitch. The Calder man nipped in and went one-on-one with the ‘keeper before applying a fine finish. The visitors were boosted by a second goal five minutes before the break when David Trncik’s shot was deflected in. When Crossley made it 3-0 from the edge of the box after 55 minutes, Calder looked comfortable and it appeared to be game over. However, Denholme threw a second, big player up front and that made the difference as a makeshift Calder defence failed to struggle against a constant supply of crosses. Shelf United had a surprisingly easily 5-0 home win over Greetland, who were losing for the first time this season. A largely young visiting side had their lack of pace at the back exposed at Lightcliffe Academy and Shelf could have scored a lot more. Harry Talbot opened the scoring early on from a long clearance and he added a second before Billy Grogan found the top corner of the net from an acute angle to make it 3-0 at the break. Talbot showed good strength to shake off an opponent and complete his hat-trick a minute into the second half. Greetland enjoyed more possession after that, with midfielder Aaron Dorward prominent, and United’s Ethan Daly had to make a couple of good saves. However, Marco Romano completed the scoring with the last kick of the game, leaving home boss John Lister pleased with a clean sheet. Sowerby Bridge picked up their second successive win with a dominant 4-0 victory at home to struggling Ryburn United. The scoreline would have been much worse for the visitors but for a string of brilliant saves from Matthew Hirst. Bridge set the tone in the first minute. Man of the match Ben Hiley won the ball in midfield and then released Damo Watkins, who saw his shot well saved. After 15 minutes Bridge hit the front when Adam Barlow released Tom Hiley and his left foot strike found the bottom corner. Midway through the first half the lead was doubled when captain Lee Wood scored with a bullet header from a Tom Hiley corner. Ryan Brook and Wood combined to set up Ben Hiley and his looping header made it three. Bridge pushed forward again in the second half but found Hirst in formidable form. Sam Hiley finally made it 4-0 when he rounded off a flowing move involving Kai Hadley, Watkins and Joel Cleary. Jake Tait was always a threat for Ryburn United, who also had some promising youngsters on show. They were just unable to stop a solid Bridge side in a game well refereed by Robert Gatenby.